The Carver C52 seems bigger than its foot-print can possibly be. 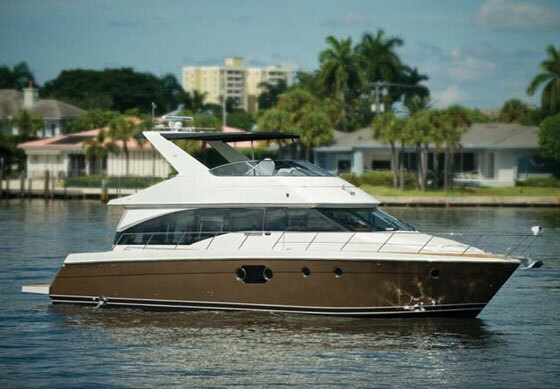 It’s not often we go on a motor yacht under 60 feet and lose track of where we are—or overlook an entire living level—but that happened to us on Carver’s new C52 Coupe at the Miami International Boat Show this year. We’re serious. 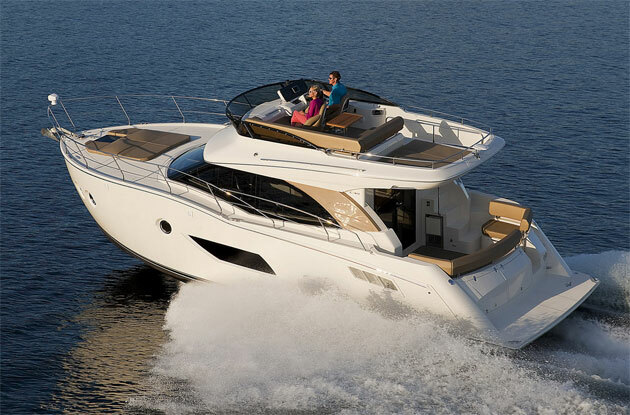 With multiple cabins, levels, and social areas it seems much bigger than any 52-footer has a right being. Don’t worry; we eventually found our way out. 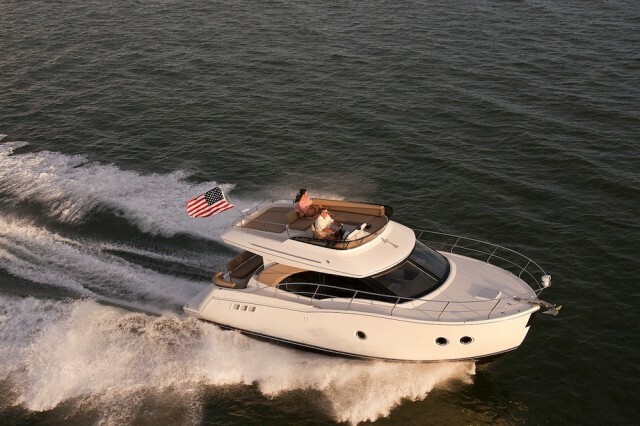 The C52 Coupe, preceded by its fly bridge kin the C52 Command Bridge, is Carver’s latest and greatest. 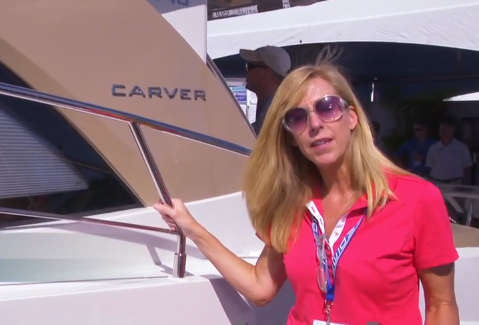 If you haven’t been paying attention, Carver Yachts is in the middle of a full-blown awakening of sorts. 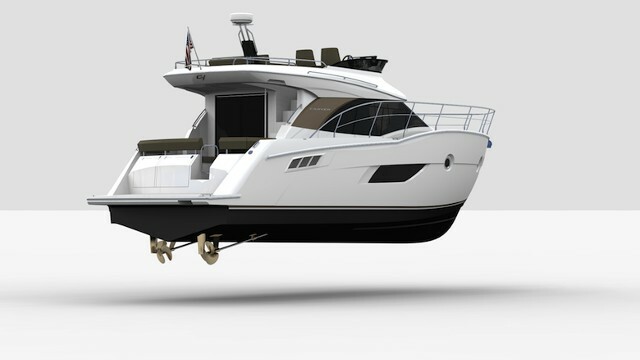 Once known more for producing what could be bulky, somewhat odd-looking motor cruisers, the company has very successfully shed that reputation in the last four years, introducing model after new model with modern good looks, lots of luxury, and swift, great-riding hulls. 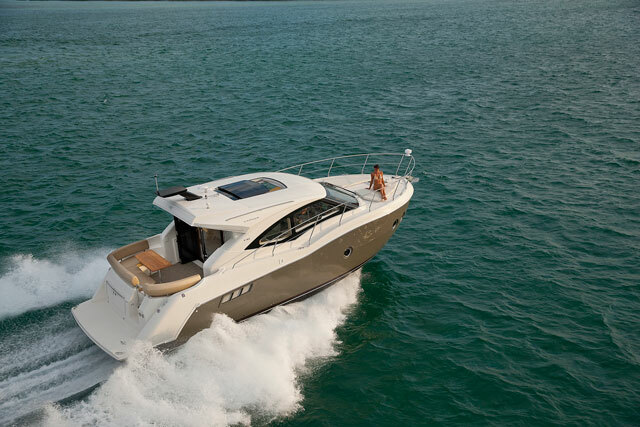 It’s a weird place to start a review, but the stern-in orientation of our review craft presented several interesting and clever features worth noting, not the least of which is a garage. Okay, it feels like a garage but is actually an easily-accessed utility space hidden inside the transom with room for a large toolbox, fenders, safety gear, dock lines, and any other items you don’t want cluttering up decks or interior spaces. A large but easy-to-lift hatch conceals the area when closed. A freshwater hookup and hot and cold showers hide behind a transom panel to port, while to starboard another panel opens up to reveal shore power connections and circuit breakers. It’s nice how Carver has consolidated these water and electric connections all at the stern versus having a virtual octopus of cords and hoses lying all over the decks. Up a couple of steps from the swim platform is the aft cockpit. 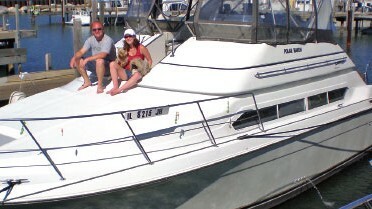 Our test craft had the optional retractable sun shade. It stows away electrically inside the cabin top when not in use, much like a turtle hides its head inside its shell. The aft cockpit is an excellent outdoor entertaining space, replete with a portside refrigerator, starboard side mini galley with electric grill and sink, and a large wraparound cockpit lounge that follows the curvy transom. Twin double-stepped stairways lead up to narrow but navigable side decks. On the bow, there’s a pair of chaise lounges pointed forward and angled back for maximum relaxation. The area has its own speakers and stereo controls. There’s easy access to ground tackle up here, as well as the robust bow cleats. Unfortunately, there’s a hatch in the middle of where you’ll be walking much of the time. It’s a trip point, and hatches don’t like being walked on, in our experience. You could never leave the main salon and aft cockpit and still have an enjoyable living experience aboard the C52 Coupe. It’s all laid out on two levels, but the lower one connects seamlessly with the aft cockpit courtesy of a pair of large opening glass doors. The lower level includes a large, L-shaped galley that’s more complete than many homes. Tucked into and on top of glossy, slick-looking cabinetry and Corian countertops are a microwave oven, two-burner electric cooktop, dishwasher, wine cooler, and a voluminous sink. Electrical outlets and switches are within easy reach. A bank of refrigeration with enough stowage for a couple of weeks or more of food sits adjacent to the galley on the starboard side, tucked away cleverly behind a huge, flat-screen television. It’s pointed toward the portside U-shaped dinette and starboard lounge area on the main saloon’s second level. The helm sits ahead a buttery, leather-smothered bench. Above it is a sunroof that opens electrically to let the sun shine in. Two panels of glass in the cabin top above the galley further lighten things up in the saloon, as does a massive windshield and wraparound cabin-side glass. Though the main saloon is cozy enough for couch sleeping and afternoon naps you’ll eventually need a good night’s rest. Farther below decks is a three-cabin layout that features a master mid-cabin stateroom and two guest staterooms forward. The forward guest staterooms are accessed from the main saloon down a set of stairs to an open atrium and common landing. The smaller guest stateroom is set off to starboard with two twin-size berths while a shared head/shower is tucked away to port. 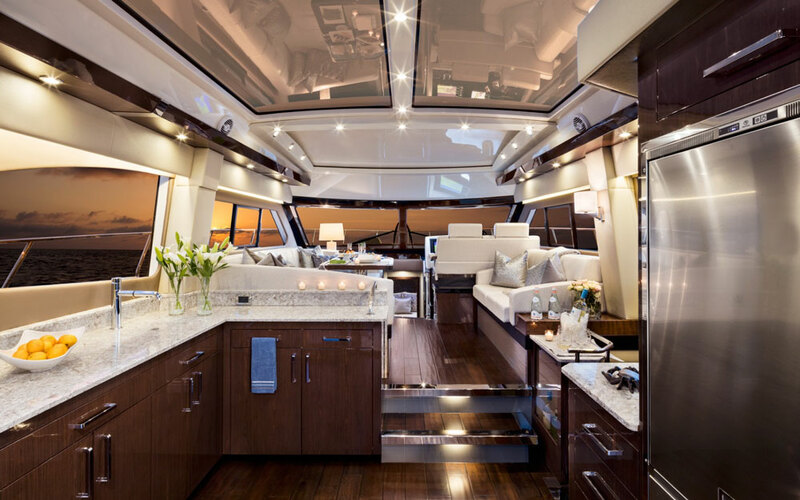 The VIP guest accommodations are in the bow with a step-up island berth, acres of stowage cabinetry clad in more dark, glossy wood, and natural light courtesy of that foredeck hatch we mentioned earlier plus two long expanses of glass set into the topsides. It’s so roomy and luxurious that we first mistook it for the master stateroom. Imagine our surprise when we discovered another set of stairs we’d overlooked in the aft starboard quarter. These lead down to the massive master mid-cabin stateroom. It feels like Vegas down here without being tacky or gilded. 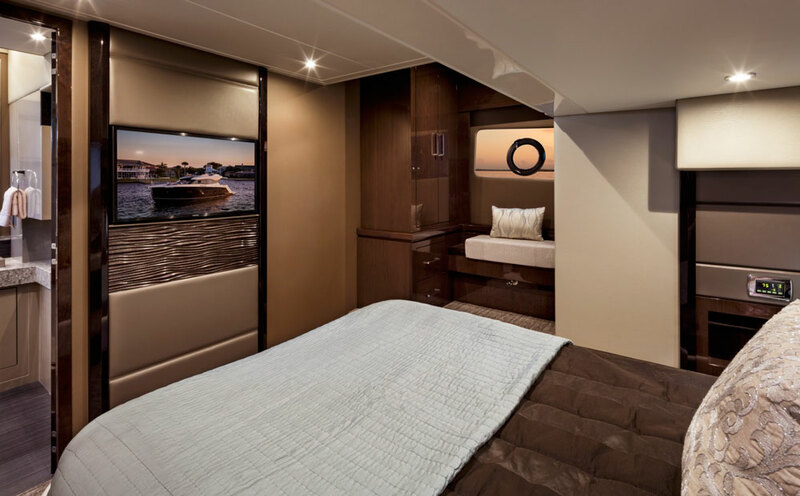 Dark tan upholstery and wall coverings along with dark, rich, glossy cabinetry give the master stateroom a luxurious and modern vibe. There’s plenty of headroom in the master stateroom, enough to walk around comfortably without having to duck or contort yourself into odd shapes. There’s also a dressing bench to starboard and a more spacious reading lounge to port. A large flat-screen television is mounted into the forward bulkhead, right at the foot of the bed, where it belongs. Entry to a huge ensuite head and shower is to port. Among all the porcelain, wood, and tile we noticed an overhead rain-style showerhead inside a full standup shower that was roomier than expected. If crewed excursions are on your itinerary an optional crew cabin can be ordered. It’s set into the transom just behind the engine room. A pair of Cummins QSC 8.3 diesel inboards lie in that engine room, accessed from the aft cockpit through a large, in-deck opening hatch. We found plenty of room for common fluid and maintenance checkpoints and good access to other mechanical components like air conditioning and the generator. The whole area is nicely finished, to boot, complete with excellent lighting and smooth gelcoat surfaces for easy cleanups. Though we didn’t have a chance to run the C52 Coupe, we’re told she’ll top out at around 35 MPH and cruise efficiently between 25 and 30 MPH. If our runs of the C52’s sister ships are any guidance, she’ll have a smooth, authoritative ride as well. Deciding where to go will likely be the only difficult decision you’ll have to make. As Carver continues to up its game and introduce new models, we’re left to seriously reconsider our old opinions of Carver models long gone by. The C52 Coupe is an excellent example of the revival underway at Carver. We can’t wait to see what they do next. 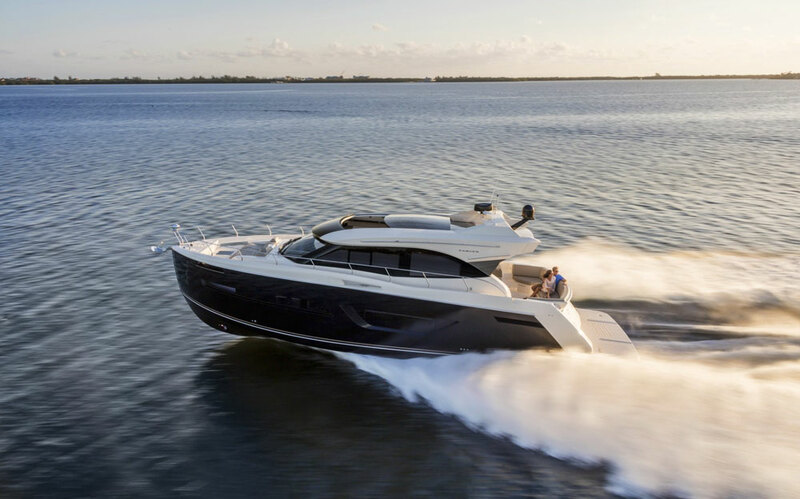 Other Choices: For equally sleek and luxurious motor yacht coupes, seek out more information on the Prestige 500S, the Tiara 50 Coupe, and the Cruisers 54 Cantius. View Carver C52 Coupe listings.